There are a couple of reasons why Syncrify won't backup files even if they have been modified on a client machine. Consider the following tips if you are running into such problem. Ensure you have not specified an invalid selection filter. A common mistake that many users make is to specify an opposite filter. For example, if your intention is to ignore *.tmp amd *.bak files, the correct syntax for such filter is: ^*.tmp|^*.bak If you omit the starting ^ character, you will end up creating an opposite filter that will only backup *.tmp and *.bak files and ignore everything else. Additionally, filters can be created on the client as well as server side. Refer to this page for details about selection filters. If the folder cache is somehow corrupted on the client machine, Syncrify may think files have not been modified and won't back them up as a result. Navigate to a deeper folder on the tree control. Select the folder, click the right mouse button and select Backup/Selected Folder. Click here for a screen shot. 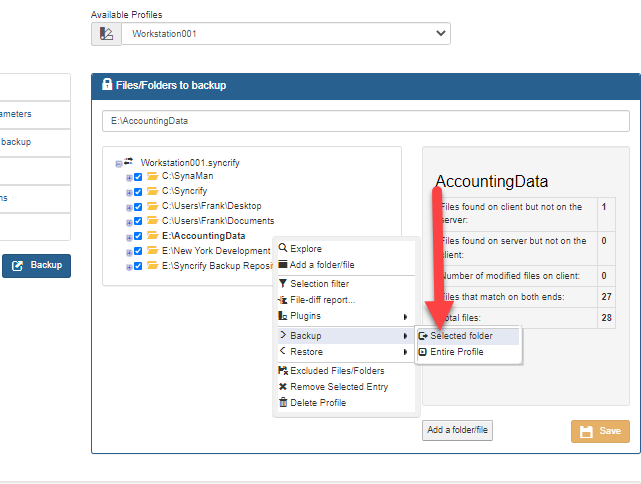 Ensure the user running backup has read permission to the files. Check the logs on the client machine to ensure you do not see permission related errors.